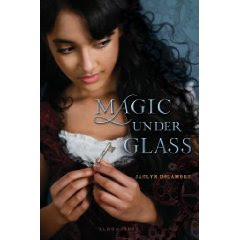 Magic Under Glass by Jaclyn Dolamore. Bloomsbury USA Children's Books. 2010. The Plot: Nimira, 17, has been a music hall "trouser girl" for three years, ever since her arrival in Lorinar from Tiansher (called Tassim in Lorinar). Nim gets an offer of a better job and a better life. All she has to do is sing while an automaton plays songs on a piano. Can it be so simple? Of course not. The reason wealthy sorcerer Hollin Parry has resorted to hiring a foreign trouser girl is because all the Lorinar singers he hired were convinced the automaton was haunted and ran screaming from the room. One minute, Nim is dirt poor trouser girl; next, she's living at a fine estate, new clothes, servants, and Parry, young and handsome, is clearly smitten with her. It's a fairy tale. Until Nim's first day alone with the automaton: "'"Mmm." A grunt came from his throat .... His eyes followed me. He was haunted." The Good: Nim arrived in Lorinar hoping to make her fortune as a trouser girl, singing and dancing. Turns out, that entertainment is no longer in fashion so she barely makes a living. Parry's offer is a chance to escape the dreariness and poverty of the dance hall. But just as her escape from the poverty of Lorinar didn't go as planned, so, too, does this escape go sideways on her. Instead of running from the haunted automaton, Nim holds her ground. Part of it is, she knows she has no options. It's either this or back to the dance hall. Part of it is, this is a teenager who was strong enough and courageous enough to go to leave her homeland and go to a new country at age fourteen. That strength, courage, and wisdom helps her as she seeks to uncover the mystery of the automaton and figure out Parry's own secrets. Of course Parry has secrets! A single, wealthy gentleman, politically connected, is almost too good to be true. Nim's world, in Lorinar, Tiansher, and other countries, is one with magic and Sorcerer's Councils, fairies and fairy wars, and oh yes -- automatons that may or may not be haunted. I wouldn't say its an alternate world, because there are no parallels to our Earth. That said, it's quasi Victorian in dress, manners, style, technology. Carriages and corsets. The fairies. Dolamore gives hints of what a fairy is (and isn't), intriguing enough so that I want a companion book set in the fairy world. Basically, fairies look like humans; there was a fairy/human war; and now their is an uneasy truce with a wall built between the two peoples. I loved the writing; my book has a ton of post-its, marking passages. Dolamore creates such a full world, with just a handful of words. Nim is at a party, both as guest and performer, for she is to sing with the automaton: "I didn't know where they'd lead, but I hardly cared. I needed air. I brushed past two men in a heated discussion, one of them gesturing with a closed lady's fan, as if he'd forgotten he was holding it. The dancers were lost in their own worlds. A little boy and a girl were hiding under a table, whispering to each other, passing a pastry back and forth." I can so see that party! But the book is full of these little throwaway lines, such as the two men with the fan, that are to fill in the color Nim's world and make it whole. Is the automaton haunted? Ah, the reviewer's dilemma! How much to tell you? I will say the following: There is a love triangle with a choice between a smart decision and the heart's decision. And there is a version of Rochester's wife that is so. cool. Nim, an outsider, finds herself and her actions impacting the politics of Lorinar. So there's a bit of political intrigue. What grade level? Nim is seventeen, knows wealthy men have "saved" other trouser girls. But it's all very proper; Parry always acts respectfully towards Nim. The "saving" is about marriage, not anything else. Also? Nim never wonders to herself whether, under those clothes, the automaton is like a Ken doll or is anatomically correct. Oh, come on! You know YOU would wonder. I did. The new cover is LOVELY! This is a very encouraging review, Liz. I'm looking forward to picking up the new cover and giving it a go. It is lovely and I'm happy to hear the story held up for you. It sounds delightful. I really enjoyed this one! The writing is full of great passages and it was a short quick read-the author put in just enough detail to keep me interested without bogging me down and making it a 600 page book which I really enjoyed. I too want a novel with the fairy's and fairy world-I want to know more about them. This had a very gothic Victorian feel to it and I loved it! Thanks for the review! I was going to say it would be a shame after all the controversy if it was bad. Thanks for reccomending it! HA! I have to say I didn't once wonder about anatomical structure of the automaton. I envisioned him more as a tin man than anything else. I'm not one that really enjoys high fantasy so I liked this book a good deal for the fact that it has elements of the fantastical but not overwhelming. In some books I find it's hard to really follow because of the overwhelming amount of detail to bring that element in. I was surprised at how I was rooting for Nim and the Automaton.